Just in case if you have missed, Google yesterday enabled offline “Google Maps” feature for Pakistan, which means you can download certain parts of “Google Maps” and store it on your phone locally for offline viewing when you don’t have internet. Whole idea is that you are shown a part on “Google Maps” that can be downloaded, with all routes, places of interests, addresses, navigation and all other information on your phone for viewing it offline when you don’t have internet. Once this map is downloaded, you will be allowed to browse the map are you selected even when you’re offline. You can even search for addresses that come under this region. Even navigation routes for any address are saved on your phone for offline access. Since Google Maps is populated by users over time, any locally downloaded “Offline Area” will expire in 29 days. Your maps will redownload with new data. This is a precautionary measure which ensures that your offline maps remain updated. During our testing, we have noticed that Navigation isn’t optimized for offline areas and you may not always get the best route for reaching any address when using the maps offline. Actual size of Offline Map for Islamabad/Rawalpindi was 57MBs instead of 300MBs that Google estimated earlier so depending on your choices, your mileage will vary. You can download more than one “Offline Area”, so you can keep storing maps of plenty of different places at any given time. However, you’re only limited by the storage space you have on your phone. It should be user’s decision to consider when a map needs updating, instead of forced expiry every 30 days. After one month if new metro bus route added and not shown on offline map then you’ll curse google maps not knowing that you are using offline. I’ll not curse, I’ll simply know that time to update offline maps has come. The problem I’m highlighting is that expiry is FORCED, whether there is new route or not, which should not be the case. What is full provincial vise data volume size and Full Pakistan? I am unable to see any NAVIGATION button. is it not enabled yet? When you have selected a route. There would be a blue ‘>>’ button on the bottom right. Click it and you are good to go! If you don’t see it, update your app. i have the latest google map app in Lg G3 android. can u plz share what exact version u have? I also seevthese two arrows butbthey donot start navigation. Instead when click onnthem they show route preview. I guess to start navigation a blue arrow of navigation is required. 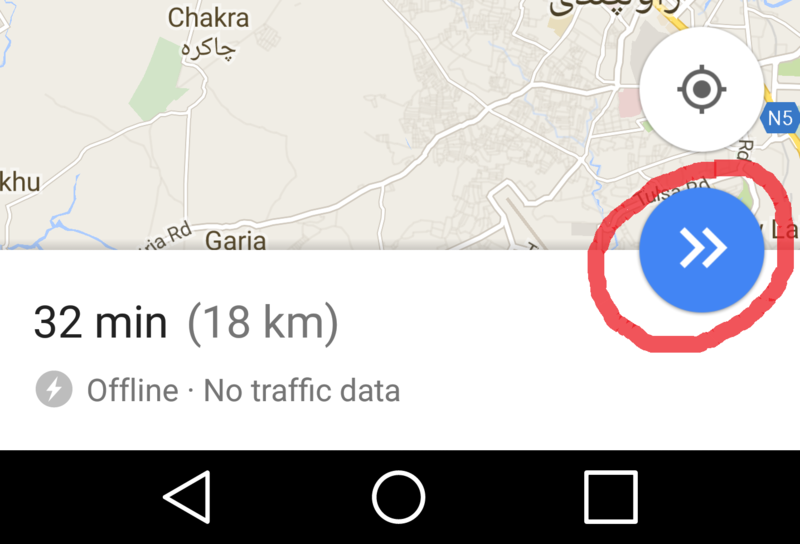 Dear google maps navigation is not enabled for pakistan yet, that is why you fdon’t get it. yeah that’s what i suspected. Thanks for the Confirmation bro. I’ll always prefer Sygic over Google Maps. SYGIC [15.5.9] is best gps app for offline navigation & they have also updated maps that is Jun, 2015. But Google is Daddy and have more updates much more quicker then sygic. Google have LOT more places names with very recent updates. Have you ever tried Sygic? if so then you shouldn’t calling google’s a daddy of sygic. 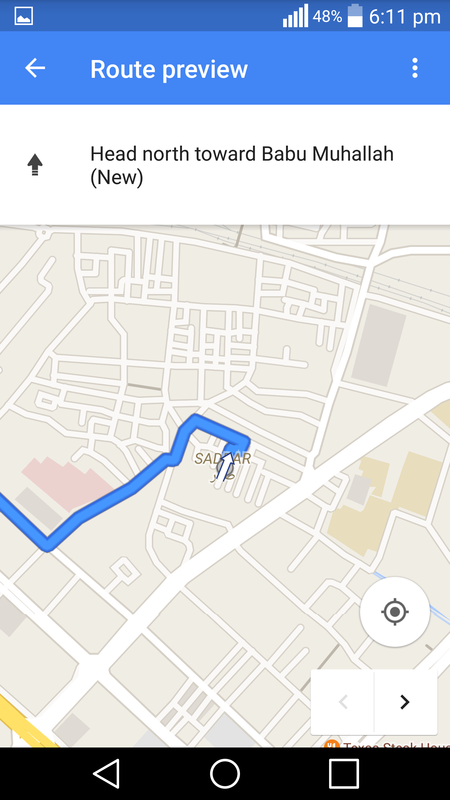 I am still unable to see navigation button in latest google map application, only route preview available. I am a huge fan of Sygic and all these years, i have preferred it over Google Maps because of the sh*t Google Maps have been in terms of offline usage. Its no question that Google Maps are the most detailed maps out there, and the only thing it lacked, was offline navigation, which WAS the reason why Sygic was my favorite. I have both of them installed in my device, so yeah i am speaking from experience when i say both of them have their own place. agree. Both products are good and have there own cons/pros. When google maps navigation will be enabled for pakistan, any updates ? Title of this post is very confusing. When you mention what people like me think of it as turn by turn navigation. And that still doesn’t work, in fact your screen turns off automatically after sometime. Are you implying that turn by turn navigation works in Pakistan?